Anna Hazare announces fast until death from Jan 30 to demand the setting up of Lokpal and Lok Ayukta! 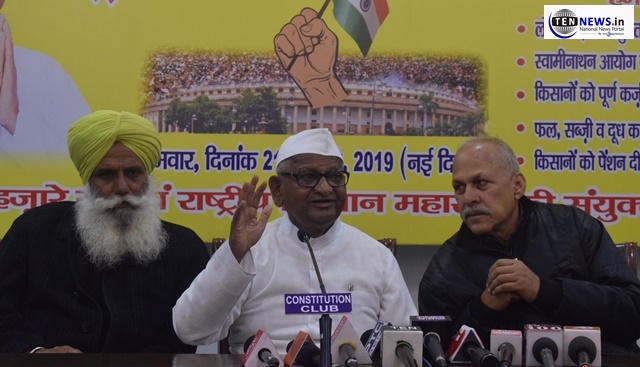 New Delhi: Anna Hazare with Rashtiya Kisaan Mahasangh will jointly hold a nation-wide protest from January 30 for the demand of implementation of Swaminathan Aayog report and other pro-farmer issues. Rashtiya Kisaan Mahasangh (RKM) which is the parent organisation of more than 180 non-political farmers organisation will lead the protest under the leadership of Anna Hazare, the massive protest will be joined by lakhs of youth, labourers and farmers. The organisation also blamed the ruling government for the current farmers crisis. – Implementation of LokPal and installation of Lokayukt in states. – Full waiving off ongoing loans of famers. – Decidation of Minimmum Selling Price (MSP) of Fruits, Vegetables and Milk.